This snippet shows how root access can be requested inside an application in order to write a file into a place we do not have permission to access usually. 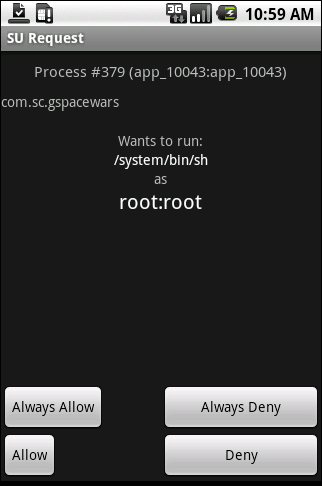 Requesting root access will only work if your phone allows it, or it has been ‘rooted’ (hacked to allow superuser permissions). This was a great help, I appreciate this post! ‘root access dialog’ is made by you? or, made by android system? then automatically show up ‘root access dialog’? The root access dialog is part of the android system, but its is only avaliable if you have “rooted” the phone it is running on otherwise permission is simply denied. ‘rooted’ gets using shell command ‘mount’ ? No, I think your getting confused. Mount has nothing to do with this. A routed phone is one that has been hacked to allow root access. Your application will only work on phones that have been rooted by the user. This is obvious for security reasons. How can I use this to access another applications database? You say you can use this method to “write a file into a place we do not have permission to access usually” do you have to try and copy files using os.writebytes()? or just a FileOutputStream? Thank you Mat. I tried to modify the hosts file but not success. Is there also a way to make the app detect when superuser permissions have been denied? Currently this code doesn’t seem to test that possibility. Nice info but how to make your jni (C Function) run as root? Have something like this in my code. tv.setText( stringFromJNI() ); // This function returns with permission denied error. I have the file created in /data folder but I guess that echo runs in a child shell whereas my jni lib gets loaded an android app env. How to make sure that the jni code runs in super user mode as well? how to use it frnds!! Did you find out an answer to your question? I know this is an old post. But I am following the sample in my own app. Can you explain the result code 255? Is that some special error code if the su binary fails? In my simple tests, it seems that the result code I am getting is the result of the command run by su. These are generally 0 for success and non-zero (I am getting 1) for non-success. So I am confused by your treatment of any result != 255 as a success. Thanks for the post and your elaboration. Awesome! Its actually awesome piece of writing, I have got much clear idea regarding from this article. I truly got into this article. I found it to be interesting and loaded with unique points of interest. I like to digest material that makes me think. ThanksThank you for sharing this great content. in order that they be effective and help customers in a very greater way. masses, will be more low key and wallet-friendly. whether or not it’s going to embody its traditional safety status or not. Familiarize yourself with certain regulations with regards to your restrictions on abandoned properties in storage facilities. she moreover really loves as a lady wonderful that’s constructed of. and successful is since they all have a very mentor or coach. focused on retirement than ever before before. this due to the political upheaval containing occurred inside the last two months. Some people think they are able to lower your expenses by in the role of their own general contractor. Anything Involving Wall Removal – Any given interior wall might be a structural part of your home. are Contractors because it fits their personal needs. Home buyers try every possible option available to find flats in Bangalore at reasonable price. guidance values, the prices of Bangalore property are expected to shoot up. Thanks, it is a very useful code! !